Our Havana Car Rental rent-a-car offices for REX, Havanautos, CubaCAR and VIA are at Hotel Telegrafo Old Havana where you can either collect or return your Havana Car Rental at this office. The normal opening hours are 9 am to 5 pm. You can also visit this office for any difficulties with your rent a car or, alternatively, call our 24 hour number on your contract and our 24 hour breakdown will come out to your location in Havana rapidly. We don’t usually keep non pre-booked rental cars at this location, so we highly recommend booking your Havana Car Rental in advance. Please remember that, for your convenience, online bookings are accepted for same day Havana Car Rentals or, for any time in the future, by simply using a major credit card from any nation. You are advised to book in advance as this will guarantee your car at our Hotel Telegrafo Old Havana office and also avoid disappointment when you cannot find a car or have to pay “walk up” rates and our last-minute car supplement. The nearest gas station to this collective Havanautos, REX, VIA or CubaCAR Havana Rental office at Hotel Telegrafo Old Havana is called Cupet and is 5KM from our office driving west along the Malecon you’ll see the Tangana Gas Station to your left. If you wish to collect your Havana Car Rental at Hotel Telegrafo Old Havana and drop off in another location, please indicate this when booking the vehicle of your choice. If you’re looking for hotel accommodation near Hotel Telegrafo Old Havana we offer numerous Havana Hotels, all with our guaranteed zero prepayment and 100% guaranteed confirmations. 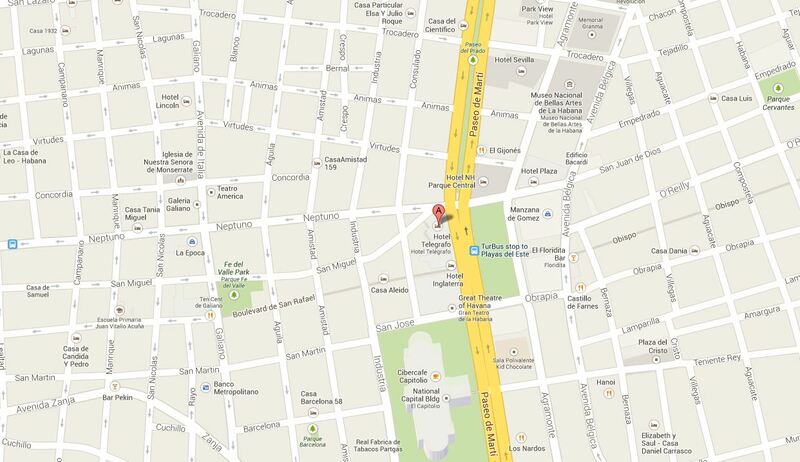 Our Hotel Telegrafo Old Havana office offers maps and basic car maintenance service so, if your Rent a Car is due for a service or periodic check, as shown on your car rental contract, then you can take it here. 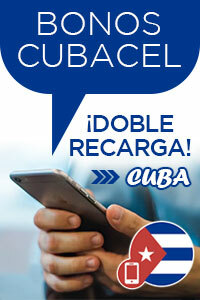 To Book a rental car in Hotel Telegrafo Old Havana Havana Cuba. First choose the type of car you need (see models shown), select your dates then, simply chose “Havana Downtown” when booking or choose this address directly if it’s shown. 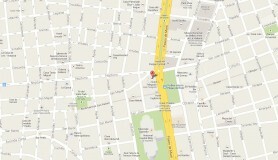 Need a map of our Hotel Telegrafo Old Havana office? Click the map for a larger printable version of this Havana Car Rental office.